Add and monitor one or thousands of applications at once, edit them in batches, use auto-adding of continuity data. 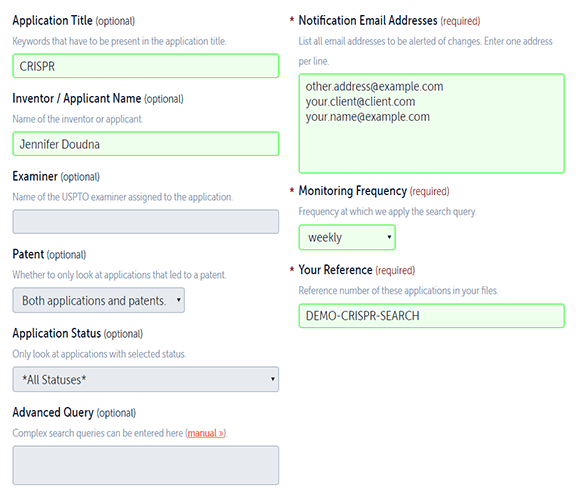 Get notified of any changes to applications monitored by you, e.g. by email. No need to visit the troublesome websites of patent offices ever again, because all data is prepared for you for easy viewing. 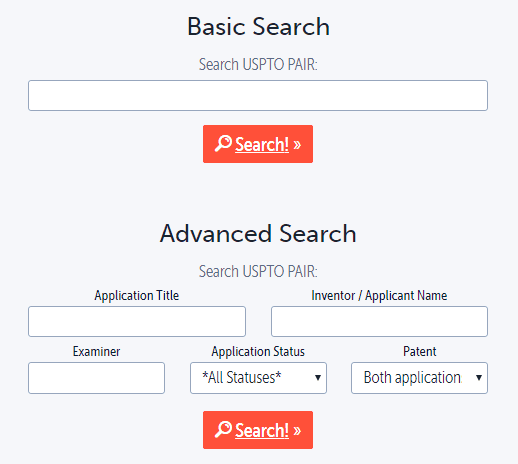 Search the complete databases of USPTO PAIR, EPO Register, and WIPO: keywords, titles, inventors, applicants, examiners, and much more. Multiple users with different access rights, secure and encrypted data storage, we have it all. Our software runs in the cloud and can be accessed from anywhere and with any device, both desktop and mobile. Need help with adding applications, or have any questions? Customer support is included in all prices. Do you have specific software you’re already using and want to connect it with Patentswatch? Please contact us! Apart from adding applications yourself, you can always send files or lists to us. We also help you migrate from other software. 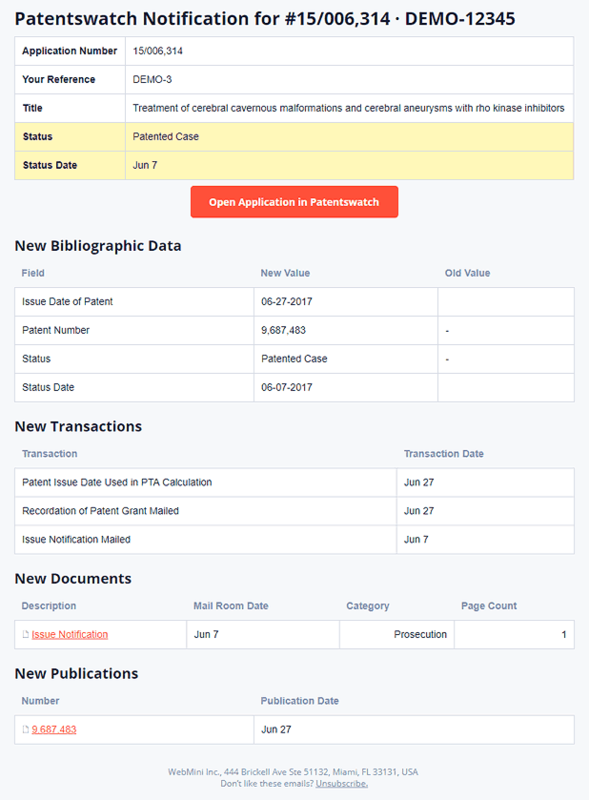 Adding applications to be monitored by Patentswatch can easily be achieved by providing a list of USPTO applications numbers (other types such as PCT numbers are supported as well). Enter a list of email addresses to be alerted of changes, the desired monitoring frequency (e.g. monthly), and optionally a custom reference (e.g. your docket number). Patentswatch can also check for new and/or updated applications that fit into a specific search pattern. For example, you can use this to get notified when a certain inventor or applicant has filed a new application, or when certain keywords are present in a new application’s title. Complex search patterns are also supported (please contact us for details). Sometimes, you might want to edit the settings of several applications at once, such as adding a new email address to be notified of changes. 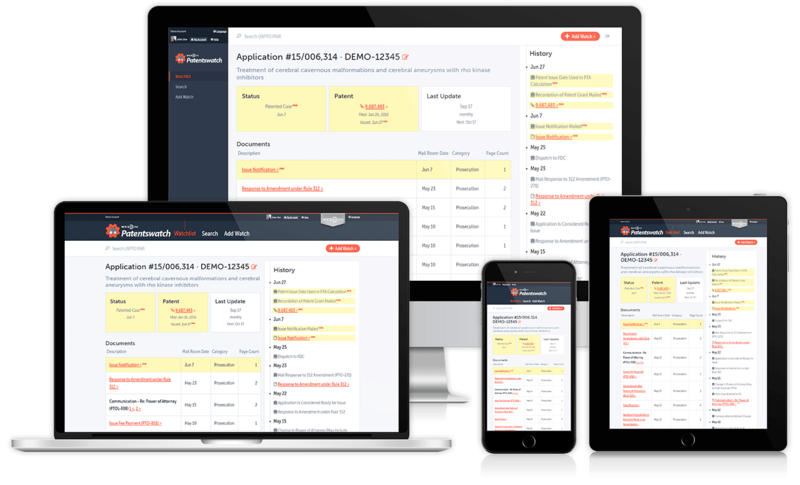 Where other software would force you to edit each application one by one, Patentswatch allows you search for and then select affected applications and edit them all at once. General information about the monitored application. Recently changed values are highlighted. Documents can directly be opened and downloaded from Patentswatch. Your custom reference for this application, e.g. your docket number. Key information such as application status is displayed right at the top. Recent changes are always highlighted, such as new documents, new transactions, or change of status. All continuity data is monitored and you are notified of any changes. Optionally, applications listed in continuity data can automatically be added to the list of monitored applications themselves. Your alerts for this application. Adding alerts in batches and/or to multiple applications at once is possible. Your custom reference for this application. Complete list of events including office actions, transaction history, file wrapper, publications, continuity data, and more. Similar events or documents with the same date are aggregated for a better overview. All inventors are listed and can be clicked to search for other applications of this inventor. Settings can be easily changed, such as alerts, custom reference, monitoring frequency, etc. Search the complete USPTO PAIR, European Patent Register (EPR), and WIPO (PCT) databases with a quick basic search that applies your keyword to all fields, or use the advanced search for more specific patterns such as by inventor name or application status. Search results can be ordered in your preferred way such as by most recent status date. 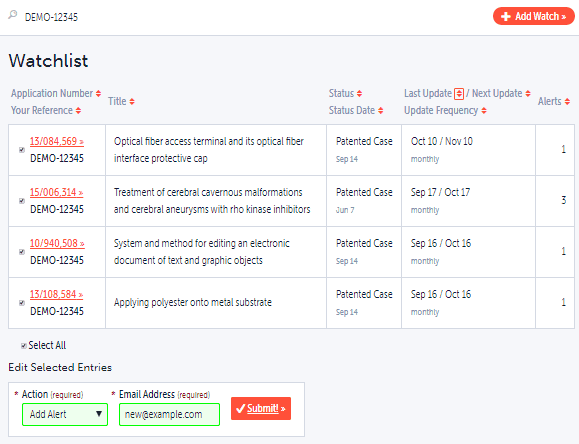 You can select all applications of interest to you and add them to Patentswatch monitoring with ease. All sensitive data is stored encrypted only, using the same technology as banks. The world-class, highly secure, ISO 27001 certified data centers used by us utilize state-of-the art electronic surveillance and multi-factor access control systems. Data centers are staffed 24x7 by trained security guards. Our systems are designed to keep running even if multiple parts fail. All your data is backed up at least daily and stored at multiple locations. All payment transactions are processed using secure encryption on a PCI-Compliant network. Every new day brings new security challenges. We keep our systems and software up with the state-of-the-art in security. We have been in business for 17 years and use all that experience to keep our systems safe for many more years to come. Adding applications for you from files, lists, Excel sheets, etc. you send us. 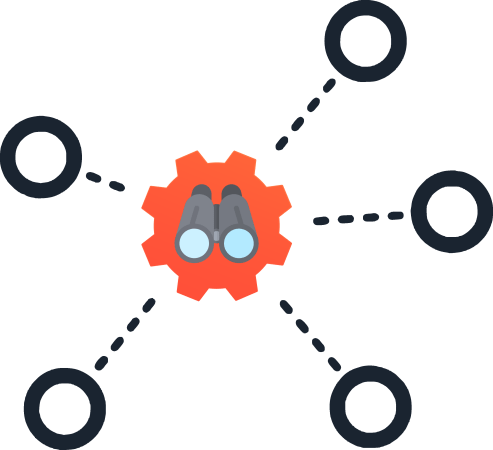 Setting up advanced queries for our keyword monitoring solution based on your requests. Adding new features to our solution based on your feedback. 305-460-2274Call our sales & support team. Live ChatWe’re online and reply instantly. Automatically have patent applications added to other software when adding them to Patentswatch, or have them automatically be monitored by Patentswatch when adding them to other software. 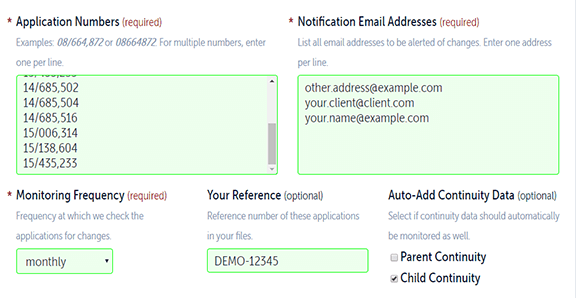 Patentswatch can also send automatic alerts to other software whenever changes occur to monitored applications. Please contact us for details. Patentswatch comes with a fully featured REST API. Please contact us for details.